Haven’t you ever noticed that brussels sprouts come in so many different sizes? In fact, after much research in grocery store and farmers market bins, we’re most likely to find varying sizes of brussels sprouts in every batch. Not every brussels sprout is created equal and in fact, sometimes they vary so much in size that it can be a nightmare in the kitchen. Different size brussels sprouts means different cooking times and over the years, we’ve found that readers who have made our brussels sprouts recipes have had varying cook-time results. 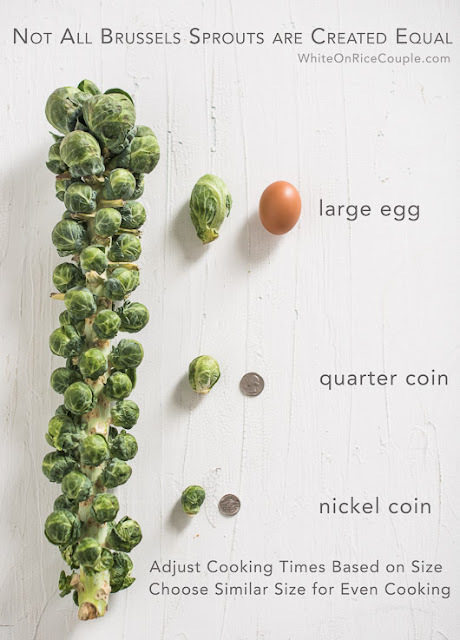 It’s always because of the different size of brussels sprouts that changes cooking times so we’re hoping this visual explanation will help us all in getting the best results out of our brussels sprouts recipes. Some brussels sprouts are huge, almost equal to a standard large egg. While others are more around the size of a quarter, others can be as small as a nickel. This drives us nuts when we need about two pounds of the same size brussels sprouts for a recipe because we want everything to cook evenly. The smaller brussels sprouts tend to have a sweeter flavor but their center leaves are a little tighter, often taking a little more time to cook or roast all the way through. While the larger ones might seem like they take longer to cook, the inside leaves are a little more loose and separated, allowing the heat and juices to flow through and cook quicker. It all seems the reverse of what it should be, so just remember, the more dense and tightly packed the leaves are, the longer it should be cooked. There are so many other factors in a recipe that can change brussels sprouts cooking time from the amount of oil, spices, juices and cheese. Just try to find as many of the same size as possible to get consistent cooking. Cook them to your preferred texture and enjoy more brussels sprouts because now is the season to indulge in one of our favorite vegetables!